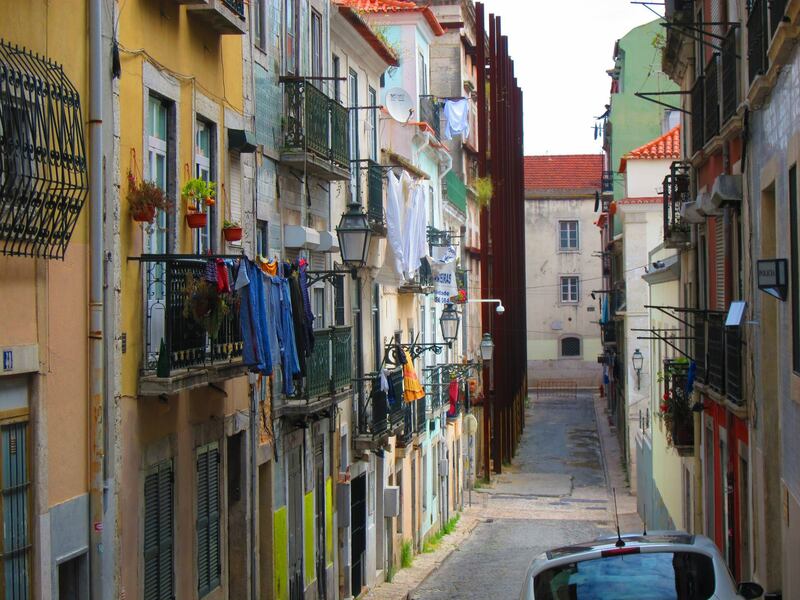 Lisbon is so full of life and full of culture. The beaches, the nightlife, the history, the food, the shopping…this city has something for everyone! I took a trip to this awesome European city with a girl friend of mine. We stayed at the Vincci Hotel. It was a great location near the water and yet central enough to walk to many places and just around the corner from a tram stop. The room was clean and large for a European hotel room and the hotel staff were very helpful. We did the Hidden Lisbon tour and thought it was fantastic. It was small enough to be able to ask questions. The guide spoke great English and offered many good options for tours. It was also very reasonably priced per person. Our favorite dinner, by far, was 100 Maneiras. This was an amazing gastronomic experience and worth every cent. The menu is prefixed for everyone… in other words, you don’t choose what you eat. You show up and they serve course after course and your only option is whether or not to do the wine pairings…I highly recommend both! As soon as you’ve committed to this extraordinary experience, make a reservation! 100 Maneiras is in the Bairro Alto which has a fun night scene. Again, highly recommended! For dinner, check out Sessenta. If you arrive too early, grab a drink at the 5 star hotel, Real Palacio just across the street in their upscale bar. Their cocktail menu is fantastic, just be prepared to pay 5 star prices. For traditional Fado, we went to O Faia. Though I’m told this is a touristy part of town and there is better…. We enjoyed it and loved that there were several Fado singers so that we didn’t get “bored” with any one in particular. Our tour guide mentioned Faca e Garfo as a very popular eatery for locals. As such, we popped in early in the afternoon and asked to make a reservation for that evening. They said they would remember us, and they did! Though, don’t be late, they WILL give your table away! We certainly enjoyed this mom & pop restaurant, thought it was relatively cheap and enjoyed the home made desserts! Faca e Garfo was a great local dining experience. A day trip to Sintra to see Pena Palace and Sintra Palace is well worth it. 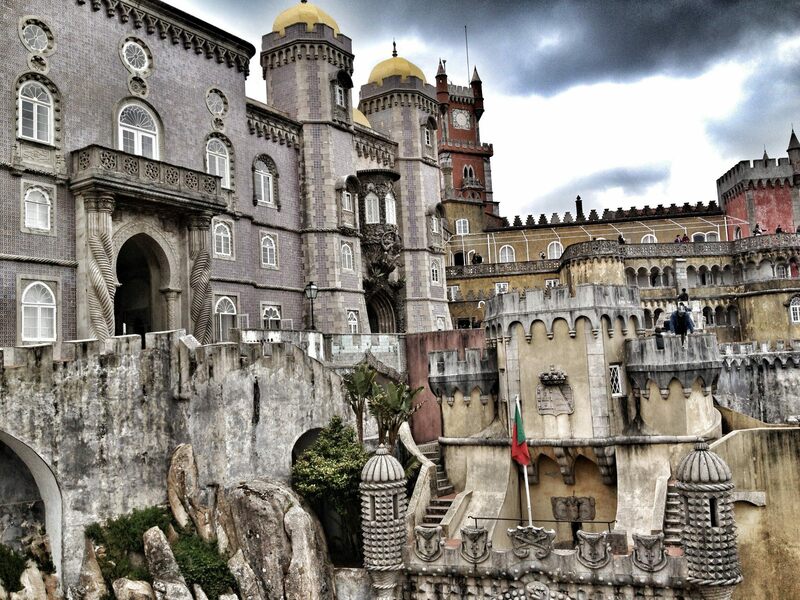 Have lunch at Pena palace in their café or restaurant then head over by bus to Sintra national palace. Pena Palace is a must for every bucket list and is at the top of my list for favorite castles! For a day trip, we went to Cascais by train by way of the Jerónimos Monastery. Be aware of the beggar “without legs” who actually does have legs….After the Monastery, walk up to the Pasteis de Belem. This café is actually huge, keep walking all the way to the back, even when you think it’s the end, it’s not…keep going. There are more tables in the back where you can avoid the crowds who loiter in the front. Sit for a pastel de nata which is a traditional Portuguese treat…they’re amazing…AMAZING! 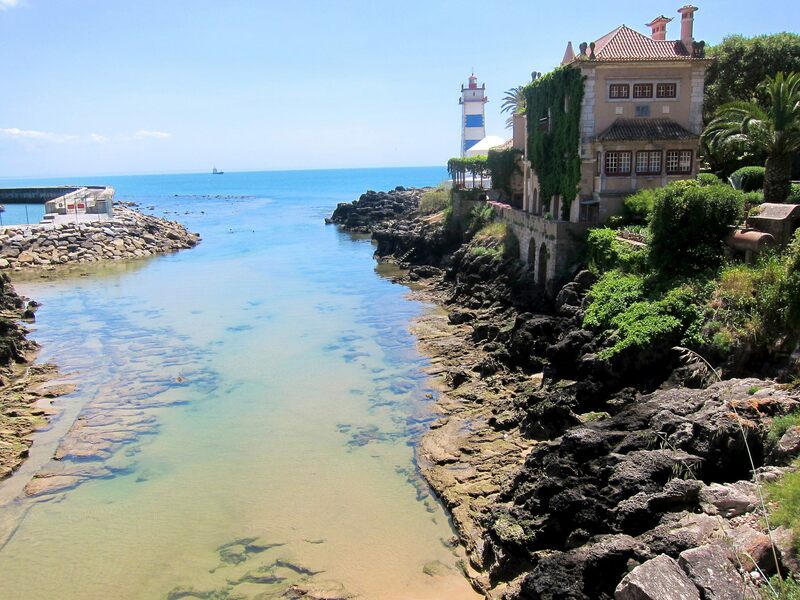 Cascais is a beautiful coastal town and we had high hopes for some beach time. Unfortunately, the small beach front area we could find was heavily populated. Therefore, we hiked up to a hotel where we had lunch and laid out by the pool overlooking the water instead. I don’t quite know how we got away with it, but for the bold, you can try pirating the Farol Design Hotel for lunch (open to the public) and if you’re lucky, a little sunning by the pool. This entry was posted in Lisbon, Travel and tagged 100 maneiras, Bairro Alto, Cascais, Europe, fado, Ginjinha, hidden lisbon, Jerónimos Monastery, Lisbon, music, Pasteis de Belem, pasteis de nata, pena palace, Pessoa, Portugal, Real Palacio, Sintra, sintra palace, tram. Bookmark the permalink.